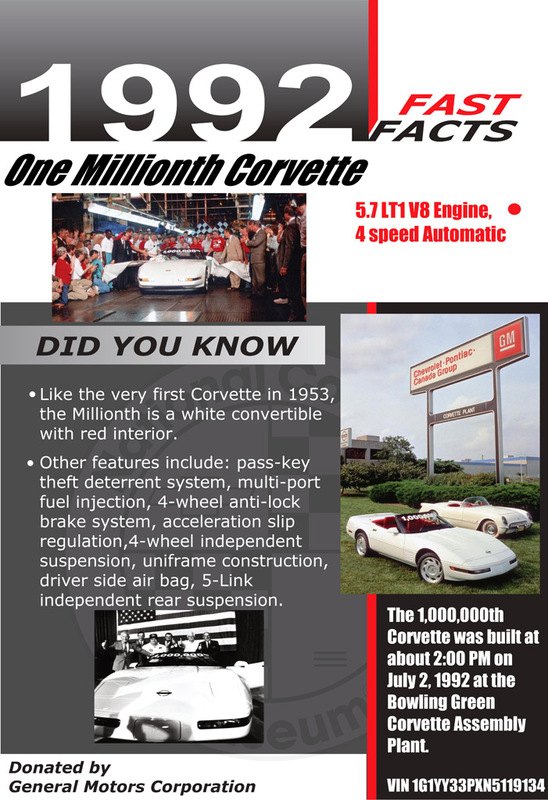 A lot occurred between June 30, 1953 and July 2, 1992: one million Corvettes were built! 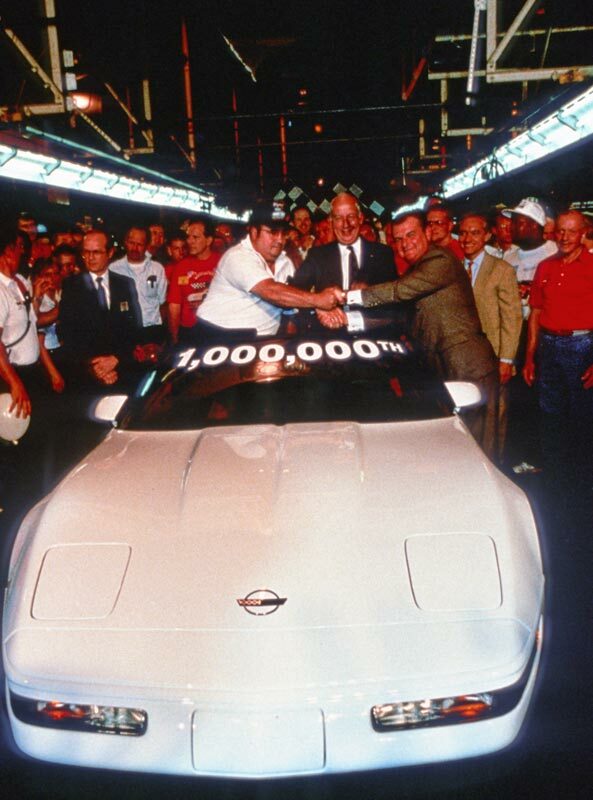 Considering the humble and precarious beginnings, the Corvette milestone was one few could have predicted. 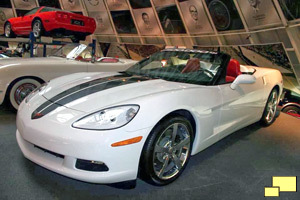 The color choice for the one millionth Corvette - white with red interior and black roof - was appropriate. 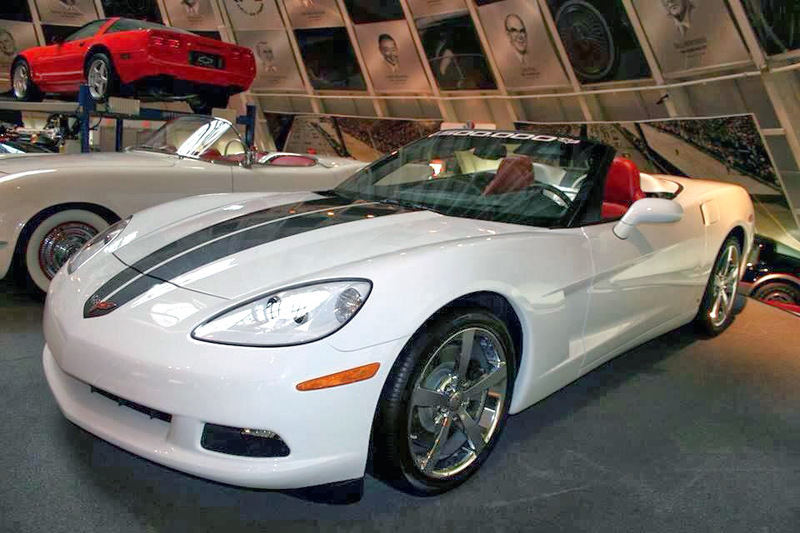 This was a nod to the 1953 Corvette, whose entire production run of 300 units featured the same livery. 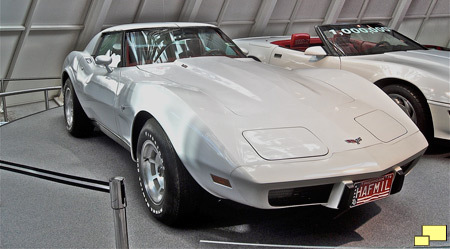 It is fitted with an automatic transmission, as was all of the 1953 Corvettes. 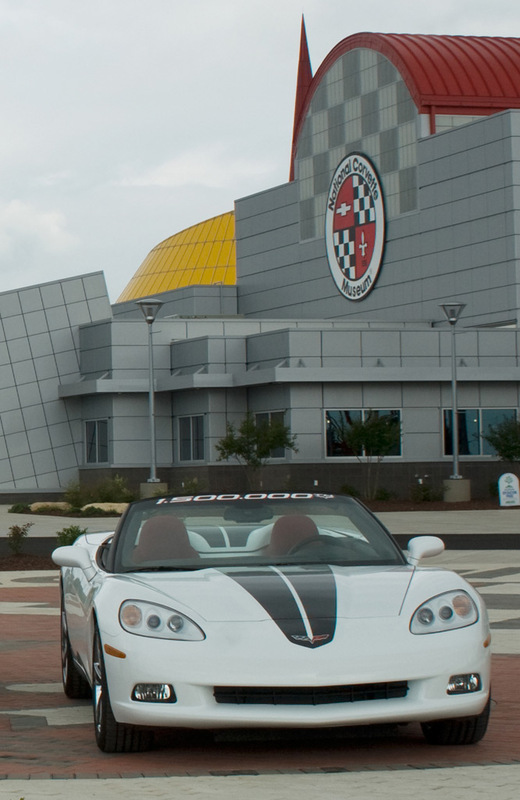 VIN: 1G1YY33PXN5119134. 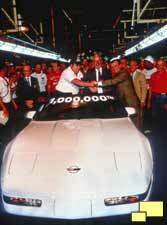 Handshakes and thumbs up were plentiful for the celebration of the 1,000,000th Corvette. 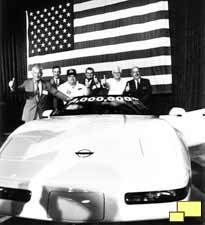 Left: Left to Right: Zora Arkus-Duntov, E. Michael Mutchler (GM VP), Billy Jackson (Prez, UAW local 2164), Jim Perkins (GM VP), David McLellan (Corvette chief engineer), and Paul Schnoes (Bowling Green plant manager). Center: Billy Jackson (left), Jim Perkins (right) with Paul Schnoes in the center. 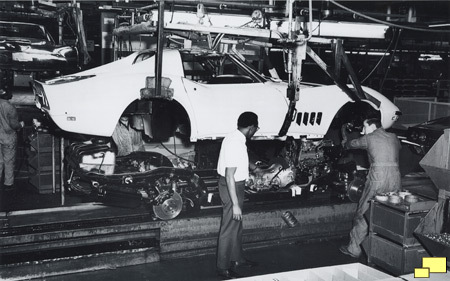 Right: Forget the executives from headquarters or the politically connected headliners. 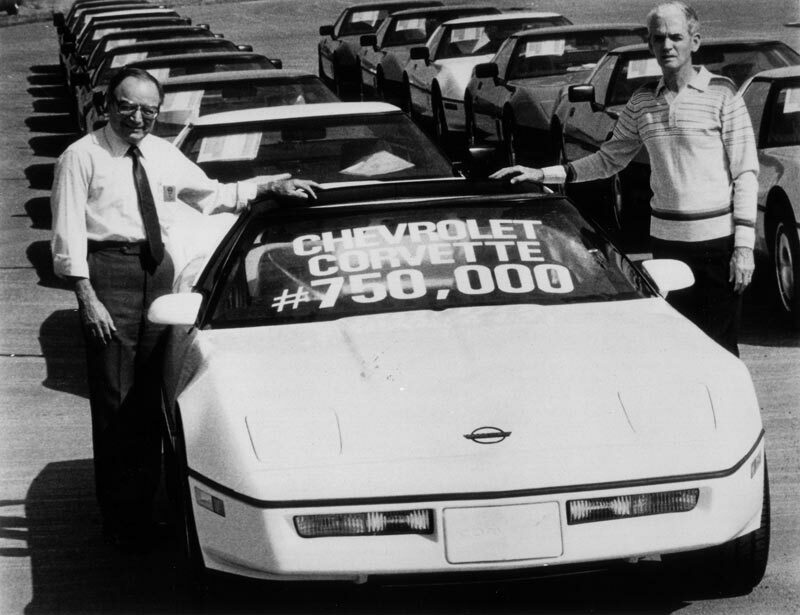 These two men are the ones Corvette aficionados look up to: Zora Arkus-Duntov (left) and Dave McLellan, the past and present Corvette chief engineers. 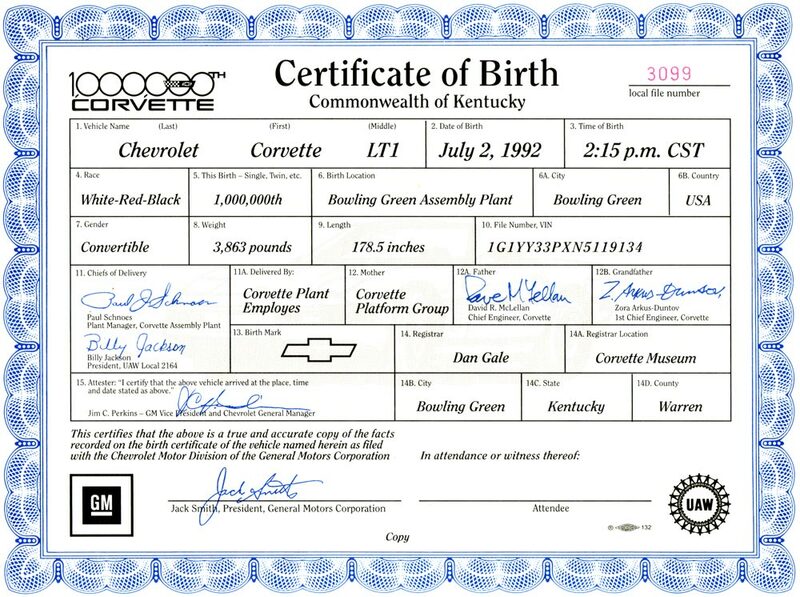 Borderline corny department: A birth certificate was issued and some of the credits were appropriate: note the "Birth Mark", Race and Parents. 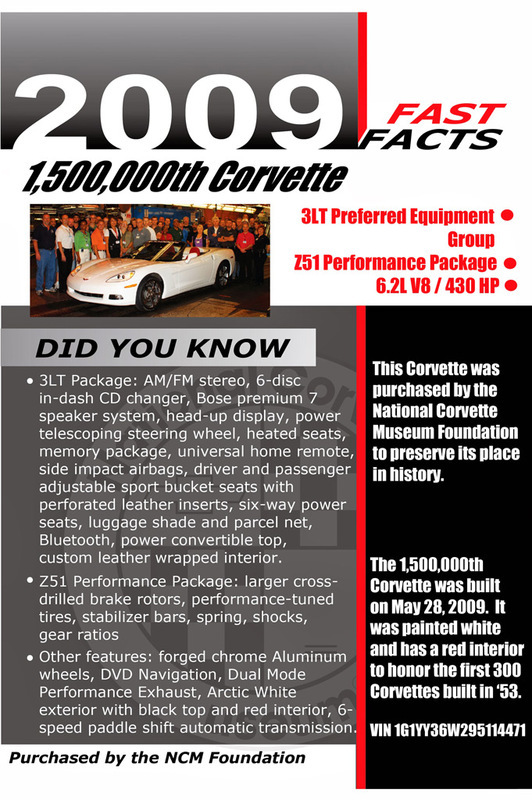 The 1.5 millionth Corvette, built on May 28, 2009, is a automatic transmission white convertible Z51 3LT with red interior and black top. 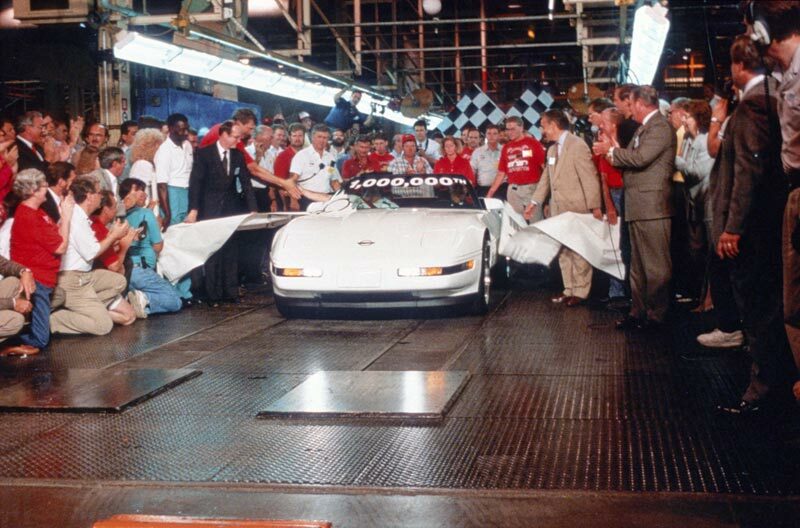 The 750,000th Corvette - a C4 - was built on October 26, 1983. 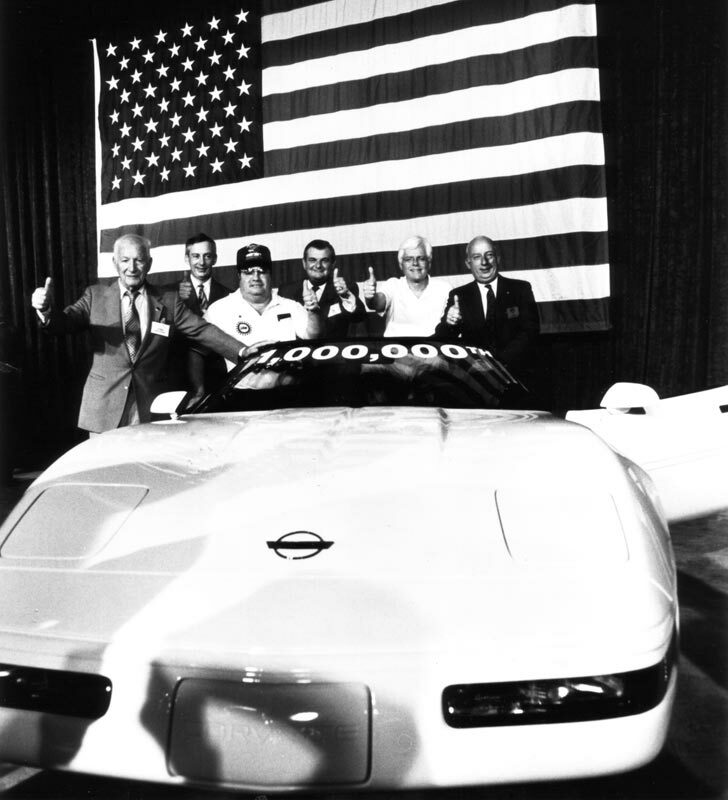 The 500,000th Corvette was built on March 15, 1977. 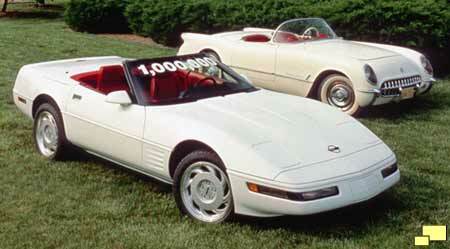 It is white with a red interior, the same as the 1,000,000th and 1,500,000th Corvettes. 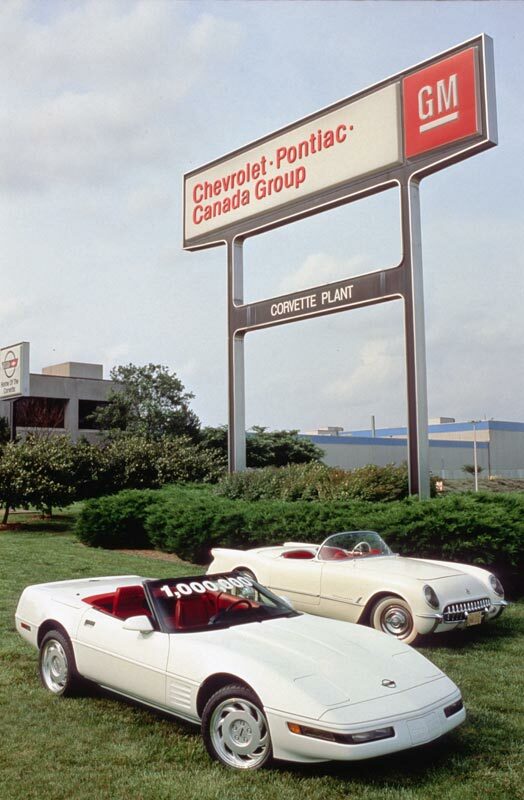 Unlike other milestone Corvettes, it is privately owned. 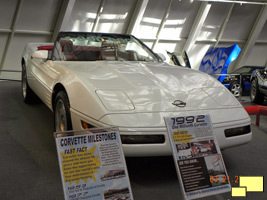 It was photographed while on display at the National Corvette Museum; notice the "HAFMIL" license plate. 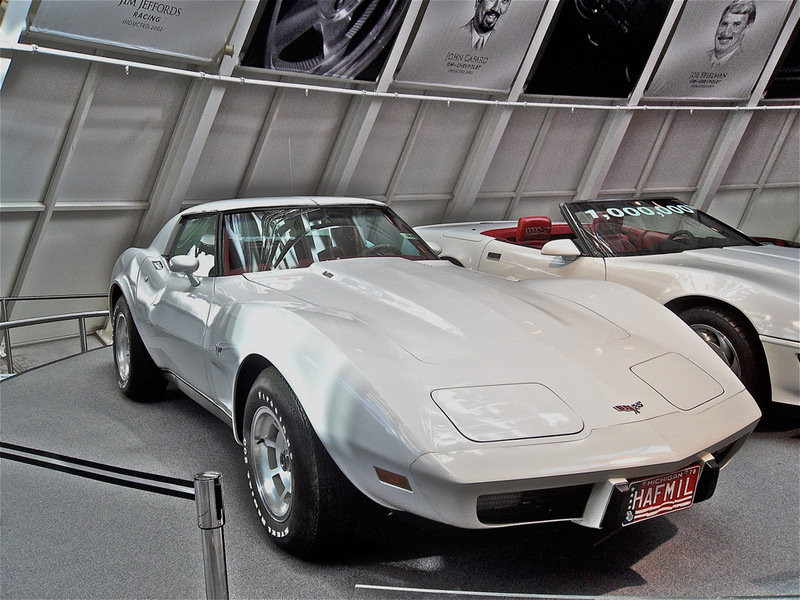 The 250,000 Chevrolet Corvette was built on November 19, 1969. 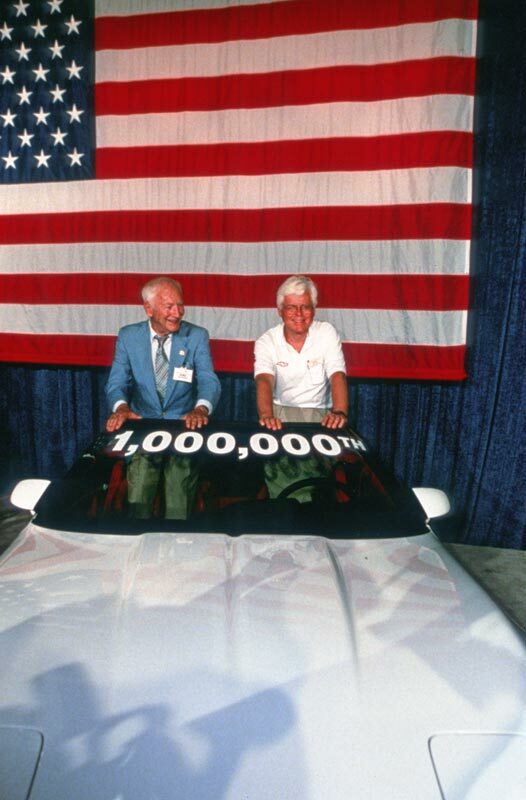 It was purchased by George A. Dyer of Montebello CA, a business machine technician who traded in a Plymouth Barracuda. 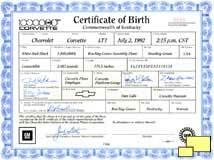 It is still privately owned. 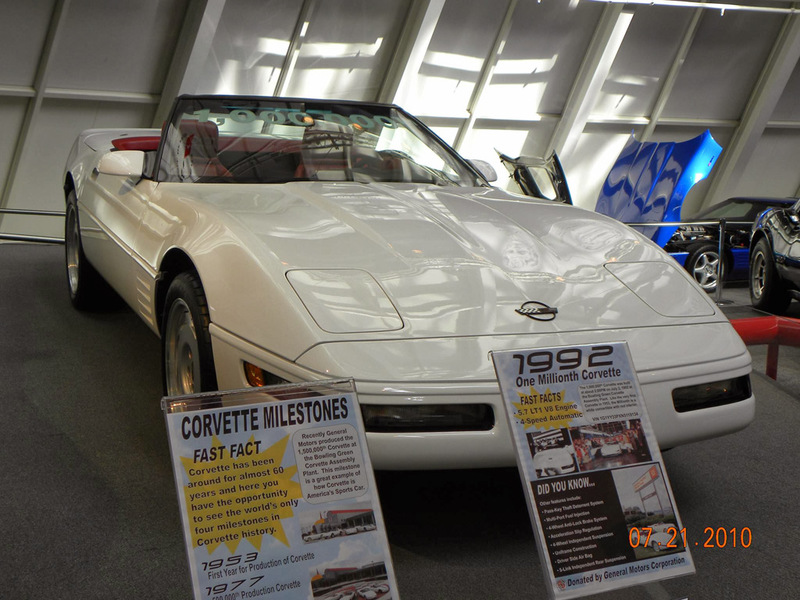 It is the only milestone Corvette without a white paint / red interior livery, having been painted Riverside Gold. 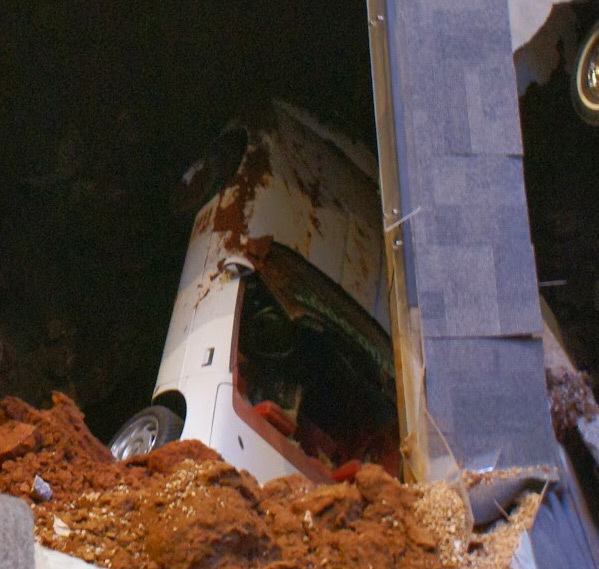 A sinkhole hit the National Corvette Museum on Wednesday, February 12, 2014. 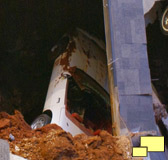 There were eight Corvettes involved in the sinkhole incident; two of the milestone Corvettes, the 1,000,000th (above and right) and the 1,500,000th (below), were involved. 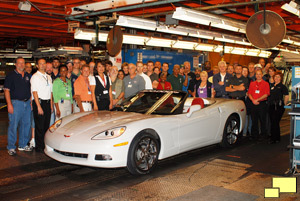 The good news is that GM has stepped up and will be restoring all eight Corvettes. The restoration will be overseen by Ed Welburn, vice president of GM Global Design. The cars will be shipped to the Mechanical Assembly facility, a small specialty shop within GM Design, where the best restoration approach will be determined.